Coming off of the artistic breakthrough of Hunky Dory the year before, David Bowie’s follow-up record, 1972’s Ziggy Stardust, unleashed one of the greatest and memorable characters in rock and roll history. If there was one main figurehead who epitomized the glam rock era of the ‘70s, it was Ziggy Stardust. But more than just the persona, the record itself is a masterpiece in which Bowie really hit his artistic stride. 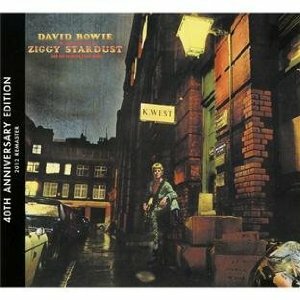 As evidenced on this new 40th anniversary reissue, the songs remain timeless as it captures Bowie at his most confident and the electrifying chemistry between him and guitarist Mick Ronson: from the orchestral-laden “Five Years,” through the glorious hooks of “Starman,” and of course the Bowie benchmarks: the title song and “Suffragette City.” This landmark album in Bowie’s career and paved the way for his superstar success and iconic status for the rest of his life. (The vinyl edition of the record also contains a DVD audio portion and contains bonus tracks including “Velvet Goldmine”).